Enjoy the debut issue of Havok Magazine, your source for the highest quality speculative flash fiction. New York Times bestselling author Tosca Lee headlines this issue with the beautiful story of a young woman who faces incredible odds when a murderous horde attacks her people. Staff member Lindsay Franklin enlightens our audiences with "Hardwired," a story of a cyborg who falls in love. Plus, read six other speculative fiction stories ranging from a steampunk Pinocchio to a woman who literally married a monster. 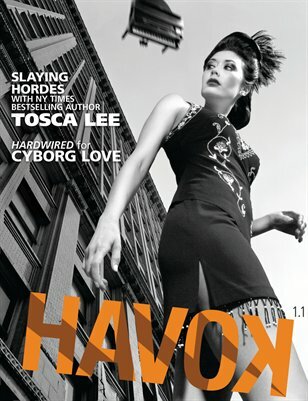 Get your copy of Havok Magazine 1.1 today. To subscribe, visit www.splicketymagazine.com/subscribe.